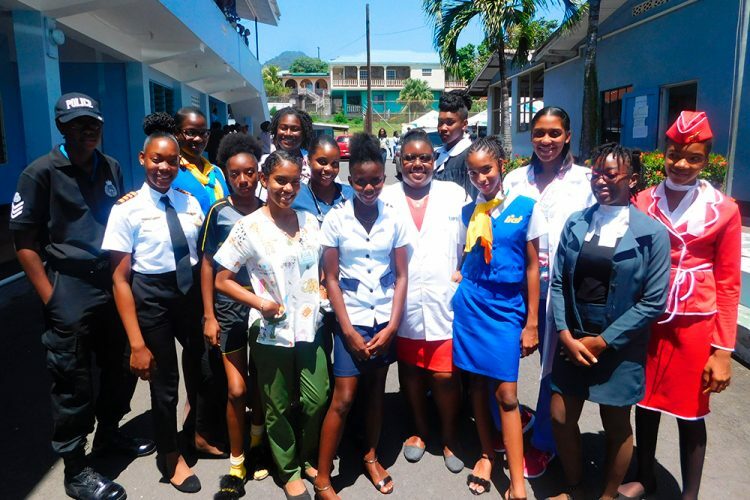 The adage that “you can be anything you want to be” was re-emphasized at the St Joseph’s Convent Kingstown (SJCK) last week, when the school hosted a career day for its students. The Career Day, which took place last Tuesday featured a variety of careers so that students could be exposed to all the options that are available to them in the working world. “The concept was basically to enlighten students on the different careers and give them a wide variety. Not because you’re doing accounts… that you have to stick in the whole accounting field, that you have to be an accountant,” Charmaine Deane-McLean, one of the coordinating teachers of the event told SEARCHLIGHT. She said that several companies were a part of the event including Coreas Hazells Inc, KPMG, the Kingstown Cooperative Credit Union (KCCU) and the National Telecommunications Regulatory Commission (NTRC). And these persons engaged in sessions with the students to highlight different career opportunities available from the managerial to entry level. Erica’s Country Style, Jazzy’s Organics, hairdressers, local designers, lawyers, police officers and other persons from different career paths were also present to offer advice and answer questions from the students. Deane-McLean also said that entrepreneurs were on hand to educate students on the possibilities available outside the corporate world. “The idea was to show that even if they went and studied a particular thing, they could also open their own business. So for example, if you went and studied business and you didn’t get to work in a company per say, you can open your own business. Even if you went to study something else and you came back and realised it wasn’t working out… I could do this on the side and it turns out successful at the end of the day,” she explained. Students were also dressed in outfits that portrayed a variety of careers and quite a few expressed satisfaction with the activities of the day.